This plug-in is written for WooCommerce 3.8 and higher. Download our WooCommerce plug-in for the Wordpress plug-in repository. Note: Our latest Rejoiner Extension Version is 1.6. Note: To install our WooCommerce extension you will need to have admin access to your store. Go to your store's admin and then on the left side nav look and click in Plugins. On the search bar, type in rejoiner to look for our extension. Next, you will see the following result show up. There, you will want to click on Install Now button. This will install the plug in, but you will still need to activate it and connect it to your Rejoiner account. 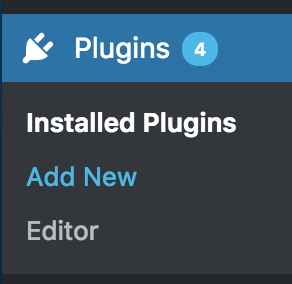 To activate it, simply go back to your plugins listing. Look for WooCommerce Rejoiner and click on the Activate link. To connect your store to Rejoiner, please follow our configuration instructions. 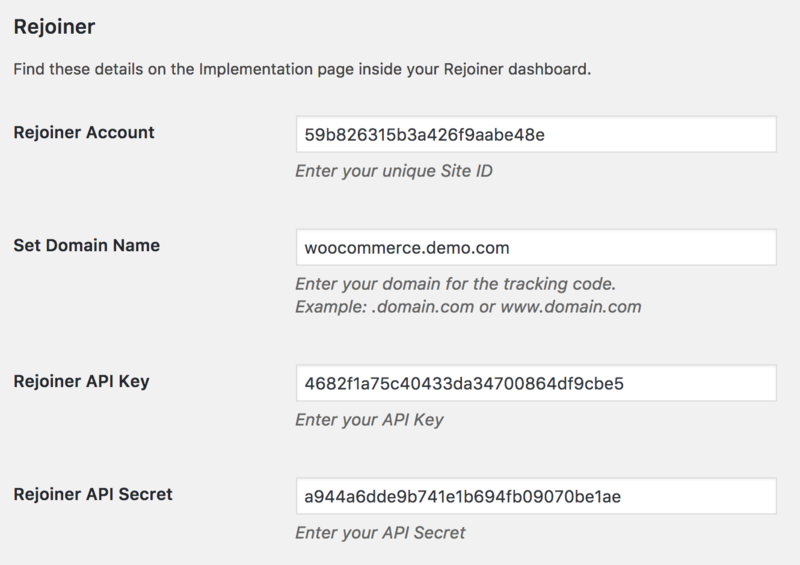 Follow the instructions below to connect your WooCommerce store to your Rejoiner account. 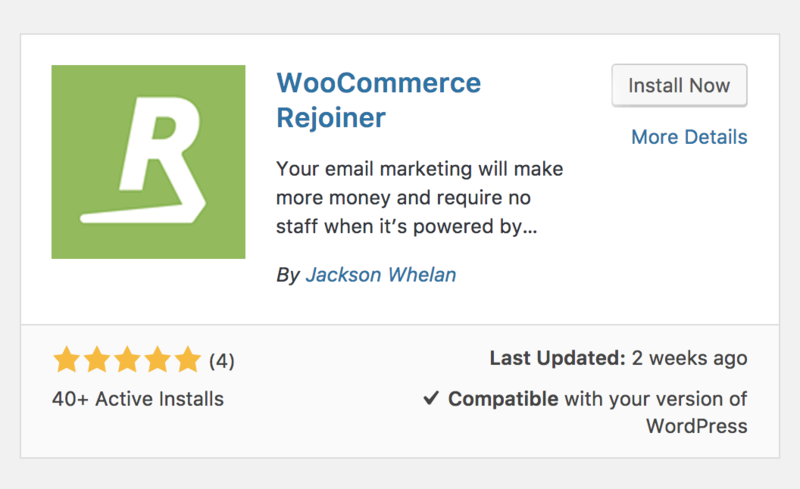 Upload, and activate the WooCommerce Rejoiner plug-in to your WooCommerce instance. 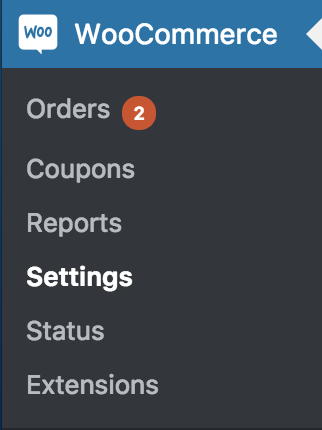 Back in your WooCommerce store's Admin, look for WooCommerce Settings in the left side nav. Then click on the Integration tab, click on the Rejoiner link. Enter your Rejoiner Site ID, Domain, API Key & API Secret. Finally, make sure you save your settings by clicking on the Save Changes button at the bottom of your Integration tab. The standard image size (width and length) you are passing us will vary according to your Wordpress theme. However, sometimes you will want to pass us larger image sizes in order to avoid pixelated images showing in your creative–this also helps with rendering images for retina display devices. Please follow the instructions below to modify the image size you are passing us. Go into your theme's functions.php file. Next, add the following code into your file. // Use this filter to specify the image size to be passed to rejoiner. Next, substitute the text IMAGE WIDTH HERE and IMAGE HEIGHT HERE with the correct width and height you want to use. Next, save your theme's functions.php file. To confirm that the change has taken place follow these instructions and verify the image size using the set_cart_item call, which looks like so in your Chrome Dev Tools. Lastly, right click the image and select "inspect" to see the actual image dimensions. Our integration with WooCommerce allows you to push all customers who complete a purchase to a specific Rejoiner List. Note: You will need to create a List for these customers in your Rejoiner account before employing the steps below. Go to your Admin and on the left side nav look for WooCommerce, then click on Settings. Next, click on the Integration tab. There you will see a section named Send Converted Customers to a List. We will want to select the Send all new customers who complete an order to Rejoiner option, in order to enable this feature. Once it's been selected, simply add the List ID of your Rejoiner List in the input below it. Finally, make sure you save your changes by clicking on the Save Changes button at the bottom of your Integration tab. Our integration with WooCommerce allows you to push all customers who opt into your marketing to be sent to a specific Rejoiner List. This will then allow you to send against that list in order to respect your customers' wishes. Enabling this feature creates a simple checkbox for your customers to opt into your marketing. The checkbox then gets added into several parts of your store in order to be able to maximize this feature. There you will see a section named Accept Marketing Feature. We will want to select the Yes, enable Rejoiner to gather marketing permissions from customers at checkout option, in order to enable this feature. Once enabled, we can update the remaining options of this feature. We recommend you update the Opt-In Field Label in order to set up the text you'd like to use for your opt-in checkbox. The next option is the Opt-In Status. This simply refers as to whether the checkbox should be selected or unselected by default. We recommend you leave it unselected, or as per the options shown below, leave it as Disabled by default. Next, you should add the List ID of the Rejoiner List you want to send your subscribers to.